In 1929, while Bela Lugosi was still playing his pre-film stage version of Dracula in America, over in France Danish director Carl Th. (Theodor) Dreyer began planning his own vampire film. 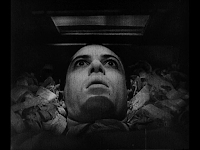 Although he would have to begrudgingly wait from its finish in summer 1931 to May 1932 for a release (so that the German UFA studio could capitalise on Universal opening their Dracula and Frankenstein first), the result would be a horror film that drew comparisons with no other - the striking fever-dream Vampyr. Dreyer was a prestige film-maker whose previous work, the 1928 historical epic The Passion of Joan of Arc was famous for his direction and the intense, method-style commitment (bordering on cruelty) he demanded from his leading lady Renée Jeanne Falconetti. Despite the film’s undisputed quality, its commercial failure prevented the studio giving Dreyer a follow-up. Consequently, to make his next film how he wanted it, he ventured outside the studio system. At a Paris soiree, he was fortunate to make the acquaintance of one Baron Nicolas de Gunzburg, whose family of wealthy aristocrat émigrés fled the Russian Revolution for the safety of France. The Gunzburgs were part of a noble tradition in their homeland of being generous patrons to the arts, already having financed Sergei Diaghilev’s Ballets Russes company in Paris. Nicolas agreed to finance Dreyer’s film in return for playing the lead role. This would not become as damaging a compromise as one might think. He was a handsome, high-society socialite actually of Russian, Polish and Brazilian ancestry, schooled in England and with the looks and style to appeal to the Hollywood set - so much so that M-G-M’s in-house photographer George Hurrell captured him to add to their glamorous gallery of 1930s stars. Whilst his impact on our story is more as a financing ‘angel’ and a somewhat limited-range performer in Dreyer’s proposed film, Gunzburg’s immaculately cool suavity would go on to make him a famous influence in the world of fashion and the arts. Supremely well-connected, he became the style guru editor-in-chief of Conde Nast’s Town and Country magazine and then worked for Vogue for over two decades till illness forced a reclusive retirement. Aside from illustrious friends like Cole Porter, celebrated fashion designers Calvin Klein, Oscar de la Renta and Bill Blass considered themselves his proteges, to the point of helicoptering in especially to attend his private funeral in 1981. Back in 1930, with the young Baron’s funding securely in place, the next step for Carl Dreyer was what story to tell with it. The choice was entirely his as there was no longer any interfering studio bankrolling him. Even in his independence though, there was one imposition he had to accept – his next project would need to be a ‘talkie’. 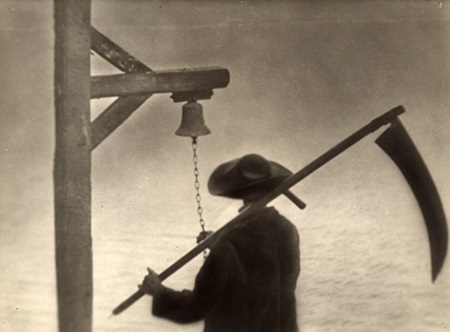 Dreyer resisted the sound era as long as he could, even planning to shoot Vampyr as a silent. Eventually, he had to recognise what was best commercially and so travelled to London to study the new sound technology. Whilst there, he made another valuable friend in a fellow Dane, the writer Christen Jul. Together they pored over 30-40 potential scripts looking for a strong mystery thriller, and it was when they spotted recurring imagery such as doors opening, their keys turning in the locks without a visible user etc that Dreyer realised “We could jolly well make this too” and write their own script instead. He acknowledged in the credits of Vampyr that the script he co-wrote with Jul was based on Sheridan Le Fanu’s short story compilation In A Glass Darkly, though only two of the five tales seem to connect with his film. There’s a hint of the famous lesbian-toned female vampire Camilla (and the fog featured therein,) and a live burial in The Room in the Dragon Volant gave rise to the infamously creepy premature burial of the film’s hero. The plot details the events witnessed by a young man, Allan Grey, who arrives one night in the French village of Courtempierre. He sleeps fitfully, plagued by ghostly spirits and an unexplained old man who gives him a parcel. He wanders out into an abandoned factory building where he sees mischievous, disembodied dancing shadows and a strange old woman who governs them. They lead him to a nearby castle, where one of them shoots the castle’s owner. The old woman turns out to be a vampire, bites the eldest of the lord’s two daughters, Léone, while Gisèle, the youngest becomes seduced by the village doctor who is in league with the vampire. Meanwhile Allan discovers the gift he was given is a book of vital vampire lore. The evil doctor drugs Allan with a paralysing potion, plunging our hero into a vivid nightmare imagining himself in a helpless catatonic state, sealed and buried in a coffin, eyes open, staring fixedly upward (an unforgettable POV scene of claustrophobic queasiness). Upon recovering, he assists an old servant to pierce the vampire’s heart with an iron stake. Grey unties Gisèle , whilst her father’s huge spectral head scares a peg-legged henchman of the vampire to death. The doctor flees into an old mill, where the door closes upon him, the mill machinery starts up and he is suffocated under a vast downpour of flour. Grey and Gisèle walk through the misty wood into the comforting warmth of sunlight. In Jorgen Roos’s documentary Carl Th. Dreyer (1966), the director spoke of what he believed were the fundamentals in preparing a project: “Two things play a crucial role. One is the script, the other is casting the actors. The entire films rests on these pillars”. Interestingly, the cast of this film only featured two professional performers, the castle lord (Maurice Schutz) and Sybille Schmitz as Léone. Dreyer met Jan Hieronimko, the moustached, self-satisfied doctor, by chance on a late-night train. For his debut lead, one-time only actor Nicolas de Gunzburg renamed himself ‘Julian West’ after incurring his family’s disapproval for working in show-business. 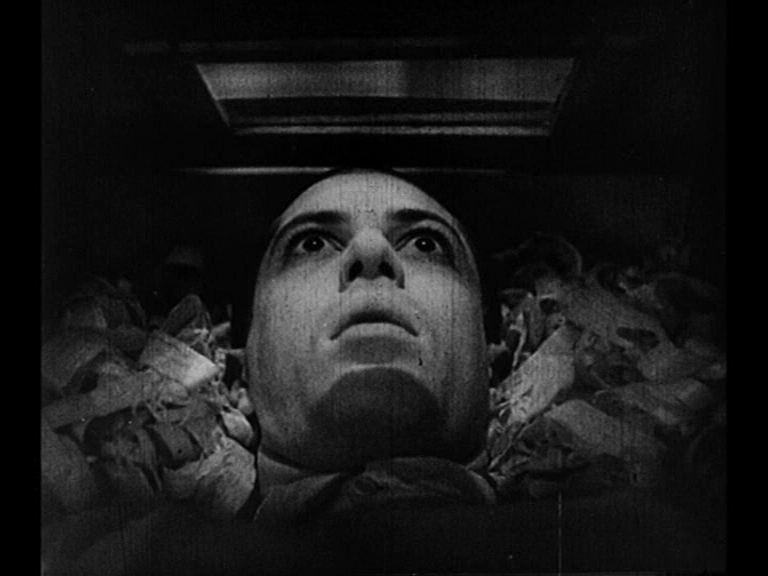 He is something of an impassive mannequin at times and yet this appears deliberate; Dreyer wanted a relatable, ‘average joe’ chap amidst the eccentrics who could experience the events at the same time as the audience without leading their emotions too easily – all part of the surreal, disjointed mind-set that Vampyr instills. As Dreyer scholar Casper Tybjerg points out in his Visual Essay, Allan’s lack of action as a character does however break the screenwriter’s mantra of never taking the plot out of the protagonist’s hands. Although he prevents Léone from being poisoned and frees Gisèle, it’s the old servant who stakes the vampire and sets in motion the demonic thud of the mill machinery to dispatch Doctor Death. Other unexplained oddities include the baffling appearance of the Terry Gilliam-esque ghostly head of the Castle Lord. He is a heart-stopper for the vampire’s peg-leg Pete crony but seems to be a quick device that is never referenced again – (this also applies to the disfigured-faced old man fleetingly seen at the inn just once and for no apparent reason). The unaccounted-for phenomena that does work are the rogue shadows, imps of unattached supernatural misrule. They are meant to be as unfathomable to Allan as to us as he holds tight on his journey into the unsafe unreal. By all accounts, on set Dreyer was confident and clear in what he wanted. In a 1971 interview, famed art director Hermann Warm (who’d previously worked on The Cabinet of Dr Caligari and for him on The Passion of Joan of Arc) credited his authority and trust in his team’s creativity as: “…the orchestra leader who must conduct all those working under him to produce a coherent, harmonious concert. Once his collaborators understood his intention…then he gave them free reign”. Although Dreyer expected his crew to buy into his vision, he was flexible enough to adapt to circumstances. This served him well when locations suggested better ideas than were on the page. To save money on rented studio stages, the entire film was shot on real locations, lending the film a real-world veracity to anchor those eerie flights of fancy. Many of the locations were sourced by Dreyer’s assistant Eliane Tayar, who found the abandoned old factory shown in the film. The owner initially misunderstood her as a buyer and was ready to renovate the place before she stressed that they wanted it just as it was. Dreyer scouted some sites with cinematographer Rudolph Maté and came across a house “where strange white shadows danced around the windows and doors…we went inside and saw some dark silhouettes. When we saw that, we knew what our style had to be – black silhouettes against a dark background”. Those shadows would be a memorable feature of his film’s unique, off-kilter magic and the contrast of black versus white would inspire the staging of the doctor’s floury grave instead of a planned marsh-drowning. In a 1967 interview, Dreyer also discussed the heady influence the Paris art scene of the 1930s had upon him. He rubbed shoulders with some of the notable painters and although claiming no special allegiance to particular names or movements, “I was influenced by the excitement, the energy, the variety of the work”, he had a fondness for Goya. Rena Mandel who played Gisèle recalled that he frequently showed her prints of the old Spanish master, whose fusion of horror and realistic imagery he aspired to emulate. Jean-Baptiste Corot’s lyrical Orpheus Leading Eurydice is often cited as an influence on her and Allan’s leaving of the wood into peaceful beauty at the film’s end. Another required necessity for adaptability was in the soundtrack of Vampyr. Although it was filmed entirely silent, with all dialogue and effects added in post-production, the actors had to speak their lines in English, French and German so their lip movements could be dubbed accurately in each country’s language. Separate French and German sequences of the on-screen text shots were filmed, though it seems an English edition was never finished. At one point, Dreyer was supervising a Danish version with cruder subtitles and title cards. Once finished, the new project’s title went through numerous changes, from Destiny through Shadows of Hell to being quoted in film journal Close-Up as The Strange Adventures of David Gray. The lead character (played by Gunzburg) ultimately changed his first name to Allan by the time of the German release. Dreyer insisted the former was simply an error. There was a baseless accusation that ‘David’ would have had unwanted Jewish connotations, but Dreyer was an avowed enemy of anti-semitism (his 1922 film Love One Another clearly fought such prejudice). A more plausible theory suggests a subtle homage to Albin Grau, the producer and set designer of Murnau’s Nosferatu which Dreyer might well have seen – Love One Another was produced by the Primus Palace cinema owners who premiered Nosferatu three weeks after their film. Murnau’s vampire movie may have been the reason Dreyer chose to place the expository book in Vampyr to help Allan understand the malevolent force he faces. The heroes in both films make use of such tomes. For Dreyer, it is possible that he felt the need to spoon-feed the viewer this mythology of the undead as audiences back then were not as familiar as modern cinemagoers with the rules and weapons. He spent two days lovingly shooting the inserts of the vital descriptive passages, possibly overdoing it as the extensive referencing at times slows the pace of the film. Other changes marked the film, courtesy of the German censors. They ordered cuts to the doctor’s protracted suffocation under the mill flour and a softening of the extended stake-hammering of the vampire. 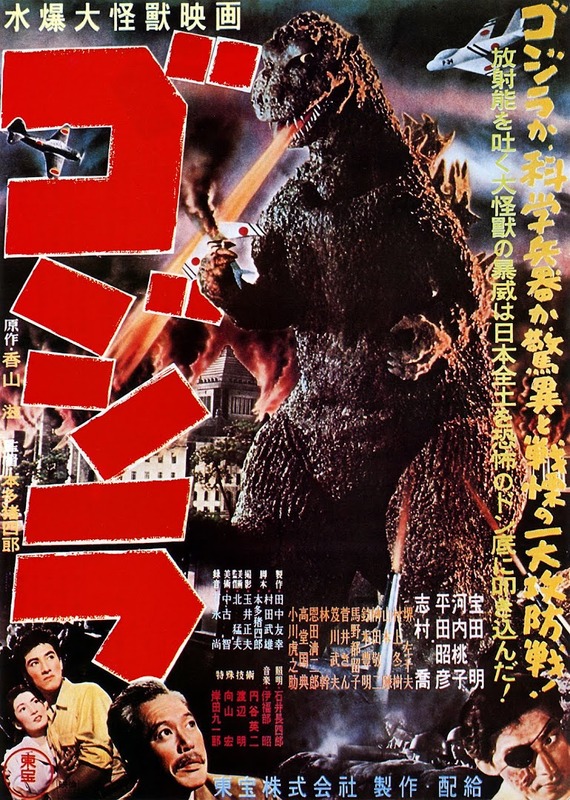 (Both scenes’ missing footage is available in the Masters of Cinema DVD version). Also, early audience reactions to the terse dialogue exchanges on-screen was such scornful laughter that Dreyer immediately self-censored some scenes to minimise damage. Either way, the name Vampyr seems to have been chosen by the German distributors to enable a recognisable marketing angle. The publicity was helped by the modernist montage technique used by designer Erik Aaes for the poster campaign. 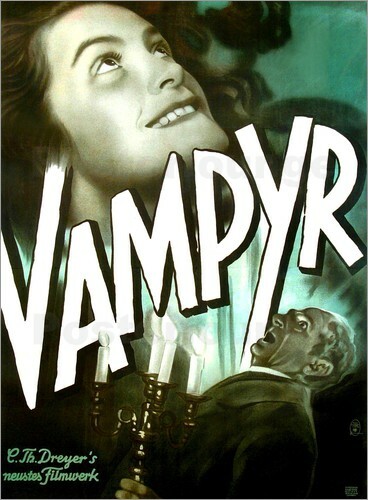 Despite the hard work by Dreyer and his team during and after production, Vampyr was not a commercial hit when it was finally brought out from its frustrated shelving in May 1932. By the time of its Copenhagen premiere in March 1933, the director himself was not present, having sadly suffered a temporary nervous breakdown soon after New Year which placed him in a French mental hospital until April. The cause was never openly discussed, though the combined stress of self-producing as well as the career freefall the failure now placed him in are likely contributors – certainly more so than the fanciful notions of any occult after-effects.